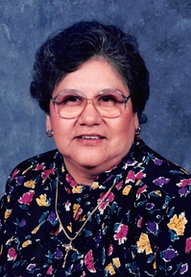 Juanita M. Tijerina of Charlotte, passed away February 4, 2018 at the age of 88. She was born May 16, 1929 in Crown, Texas to Cecilio and Guadalupe (Rodriguez) Muñoz. Juanita took great pleasure in church and community activities and groups and serving and helping. She was a very caring individual, displaying such in many ways and forms. She touched so many people with her kindness. She will be greatly missed by all who loved her. Juanita is survived by her sons, Sabas Zulaica of San Antonio, Joe “Pepe” Tijerina and wife Janie of Pleasanton and Carlos Tijerina and wife Rosie of Charlotte; daughter, Lydia Pacheco; brothers, Estevan Muñoz and Pablo Muñoz, both of San Antonio and Juan Muñoz of Somerset and sisters, Hermenia Arredondo of Houston, Beatrice Lozano of San Antonio, Cresencia Gonzales and Petra Sambrano both of Dime Box and Alejandra Burdick, Margarita Luna, Esther Calvillo, Velia Gonzales, Ernestina Salazar and Brenda Sanchez all of Charlotte. She is also survived by grandchildren, Rebecca Garcia, Rita Clower, Allison Gonzales, Marina Nixon, Jennifer Tijerina, Joey Tijerina, Lindsey Tijerina, Ibis Tijerina, Eddie Oropeza, Shannon Tijerina, Carlos Ray Tijerina and Adan Tijerina and 19 great-grandchildren. Juanita is preceded in death by her husband, Jose Leon Tijerina; sons, David Tijerina and Gustavo Gonzales; daughter, Sabas Guadalupe Gallegos; parents, Cecilio and Guadalupe Muñoz; brothers, Antonio, Felix, Cecilio, Jr. and Rogelio Muñoz and sisters, Irene Villegas and Mary N. Zuniga. Visitation will be conducted at Hurley Funeral Home in Pleasanton on Thursday, February 8, 2018 from 2 – 9 p.m with a rosary recited at 7: p.m. Funeral Mass will be celebrated at St. Rose of Lima Catholic Church at 374 Madero Avenue in Charlotte on Friday, February 9 at 10 a.m. Interment will follow at the Chilipitin Cemetery. For anyone wishing to leave condolences for the family, share memories or sign the online guestbook you may do so at www.hurleyfuneralhome.com.